Each year, 10 first-year students part of the Posse Scholars Program at Pepperdine experience college through a unique lens. Genevieve David ('15) was a senior at Rockville High School in Rockville, Maryland, when she got the call. Months earlier, David’s high school counselor had nominated her for a Posse Foundation scholarship, a full-tuition, merit-based leadership grant offered to public high school students—“young leaders with extraordinary academic and leadership potential who may be overlooked by traditional college-selection processes,” as outlined by the organization. Following her nomination, David embarked on the Posse Foundation’s Dynamic Assessment Process, a three-step interactive interview that includes large-group and individual sessions that evaluate a Posse- hopeful’s leadership and teamwork abilities, as well as their motivation and desire to succeed. She joined the almost 2,500 diverse nominees from around the country for a large-group recruitment meeting, and was one of the semifinalists invited to the Posse office for an individual interview. In the final stage, the Posse committee narrows down the finalist pool for partner schools to 20 to 25 students, and Posse-hopefuls determine their top three colleges that have partnerships with the organization. David filled out an application for Pepperdine and, in mid-December, participated in a group interview with the other finalists chosen by the University’s admission committee. 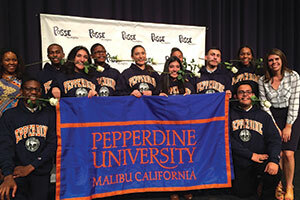 As the months progressed, she discovered what it meant to be a Posse Scholar at Pepperdine. Every Monday for eight months, she took the metro to Washington, D.C., to Posse headquarters, where she and nine other high school seniors selected to become Posse Scholars engaged in discussions during precollegiate training. “We were able to talk through what we were going to experience in college and how we could be a support system to each other,” David recalls. When the opportunity to become a Posse mentor was presented to Rodriguez, he thought, “Wow, I wish there would’ve been something like that when I was a kid, when I came here,” says the alumnus, who was one of the only Hispanic students on campus in the 1970s. His mentor was a man named Israel Rodriguez, a staff member in the admission office at the time. As David’s faculty mentor, Rodriguez not only became her campus advisor, but a spiritual one as well, baptizing her in the Pacific Ocean during her freshman year. David spent the four years that followed devoted to campus life—as a spiritual life advisor in her sophomore and junior years; as an intern for Reality Check LA, an organization that engages youth to promote healthy relationships; and by investing her time in volunteer work and women’s ministry. Through the years, Posse students have proven to be some of the most dynamic student leaders on campus. 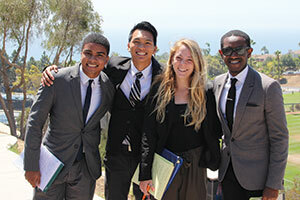 “They are known on this campus, not just as Posse Scholars, but also because they make an impact in whatever campus community they are involved in,” explains Kristy Paredes Collins, dean of enrollment management at Pepperdine. Since 2010, when Pepperdine first partnered with Posse, many students have been involved in the Student Government Association (SGA) and many serve as student tour guides, in which capacity they are able to tell the Pepperdine story through their unique lens. Sarah Houston (’14), who was part of the first Posse cohort on campus, served as SGA vice president in her senior year and received a Fulbright scholarship to teach English in Turkey in 2014. Most significantly to her, Houston was part of the student group responsible for starting the conversation surrounding mandatory diversity training and on-campus mental health initiatives by working with the Inter-Club Council and other student organizations on campus. During her SGA tenure, Houston was also instrumental in implementing the first-ever women’s initiative on campus to facilitate discussions about the struggles and benefits of being a woman on campus and bring together the different women’s groups in order to create a sense of solidarity and a larger cultural shift in how students view gender issues. She also had a hand in designing programs for off-campus meal plans and mentoring younger Posse Scholars. As the philanthropy chair of her sorority, Tri Delta, Houston contributed her time to Project Serve, and participated heavily with International Programs and Wonderfully Made, a Christian ministry dedicated to helping today’s modern young women discover, strengthen, and reclaim their true value and worth. In the 2014-2015 academic year, after four years of partnership with the Posse Foundation’s D.C. branch, Pepperdine established a relationship with the organization’s Los Angeles outpost in an effort to give back to the local community. At first, administration was concerned that reaching out to students in “our own backyard” wouldn’t be as effective. They quickly realized after talking to Posse headquarters that when looking at Los Angeles, Malibu is not exactly the backyard. The new partnership would also allow for a link between the Posse initiative and outreach to the foster youth in Los Angeles, a goal that the University plans to nurture in the coming years. “Some of the challenges that these kids face are obvious, but they especially have a hard time with the college-application process,” explains Marrs, of the setbacks related to naming family members and stating income and residence on their paperwork. Providing local students who live in the heart of the city opportunities to pursue higher education also brings different perspectives to Pepperdine. First-year Geonnie Wilson’s first experience in Malibu as a Posse Scholar was during this year’s PossePlus Retreat, an annual, weekend- long retreat where the 10 Posse Scholars, along with the group of friends, family, faculty, and others they invite to join them, discuss one of the most significant issues affecting their generation. The groups sometimes grow to 150 participants. This year’s topic gave Wilson the chance to dive deep into conversations surrounding police brutality in 2015. “We got to see different sides of each other,” the Inglewood, California, native reflects. Houston names the PossePlus Retreat as one of the most dynamic and transformative experiences that she had at Pepperdine, and recalls discussing socioeconomic class issues in America and how they impact college students while in school and as they launch their careers. She was very intentional about who to invite that year. David recalls discussions of gender and sexuality, race, and class in America during her most memorable PossePlus Retreats.